On a personal level, I can understand why WikiLeaks founder Julian Assange has chosen Ecuador for his asylum bid. If the request is granted, Assange could be stuck in the country for years. Ecuador is a great choice. The scenery is stunning, the food fantastic, and the people warm and welcoming. But is this enough to risk being seen as compromising the core WikiLeaks principle of press freedom? I wonder if, before he walked through the doors of Ecuador’s embassy in London, Assange had done his homework on the kind of country he was walking into, so that he could understand the damaging effect that this asylum eventually could have on his credibility. Over the last 20 years Ecuador has been marked by serious political instability. A succession of presidents of all political stripes have been ousted from office through a potent blend of popular protest, congressional conspiracy, and military manipulation. 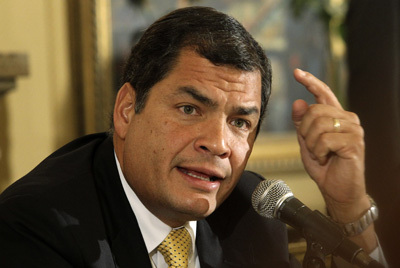 It is safe to say that when current President Rafael Correa took office in 2007, the political systems in his country were fundamentally dysfunctional and desperately in need of reform. Correa has since undertaken a massive and much-needed program to reshape Ecuador’s political institutions, including a new constitution in 2008 that was approved by a two-thirds majority in a national vote. The end goal is laudable and needed: make the country more democratic and inclusive. Debate about Correa’s ideas and the direction he is taking the country has been robust. Not surprisingly, the harshest criticism has come from the right, which conveniently had owned the major media outlets and actively controls their editorial policies. Unfortunately, the response from Correa to his opposition has been aggressive to the point where organisations such as Reporters Without Borders have raised serious questions about active government repression of the media. One case stands out in particular. On February 6, 2011 the El Universo newspaper columnist Emilio Palacio published a demonstrably inflammatory piece about Correa’s response to being trapped by a police protest on September 30, 2010 that had turned violent. In a column that was more online rant than responsible journalism, Palacio repeatedly branded Correa a dictator and directly accused him of ordering security forces to fire without warning on a hospital full of civilians. Correa responded by suing Palacio and three directors of El Universo for libel, asking for $US80 million in damages. While it can certainly be argued that as a politician Correa should have had thicker skin, there was considerable merit to the President’s case and he likely did deserve to receive a verdict in his favour. The problem comes with how the judicial decision was reached. After several changes in the judge overseeing the case, the verdict that was eventually handed down by a justice who took just 12½ hours to review 5000 pages of documentation and compose an 80-page judgment. To the great amazement of many, Correa was awarded $US40 million in damages and the El Universo directors, some of whom had fled to the US for asylum, were sentenced to three years in prison. While Correa subsequently pardoned the newspaper directors and has foregone the court-awarded damages, the case has had a chilling effect on press freedom in Ecuador. The pattern of self-censorship that became widespread in the wake of Correa’s legal steps have been reinforced by the national broadcast regulator Supertel. In just the first six months of 2012 more than a dozen radio stations have had their licences revoked and in some cases their premises were raided by police and equipment seized. Assange should be asking Correa very hard questions about press freedom in Ecuador and asking himself what asylum in that country would mean for the transparency and democracy underpinnings central to the credibility of WikiLeaks. More to the point, Assange had the opportunity to vigorously press Correa on these questions during a May 2012 edition of the show The World Tomorrow, but failed to go beyond an academic discussion of media ownership structures in Ecuador. Perhaps this was enough to satisfy Assange. The question is whether the public that has supported Assange over the last two years will be equally satisfied when they start to look at the contradictions between the WikiLeaks ideals and the concerns that organisations such as Reporters Without Borders that are legitimately raising about press freedom in Ecuador also require straightforward answers. This op-ed was authored by COHA Senior Research Fellow Dr. Sean Burgesm a distinguished Canadian scholar specializing in South American issues. Dr. Burges first began his relationship with COHA when he served as an intern with the organization. The article has been subject to edits by COHA. To view original article, click here.